ENB has been updated to include this fix. If you use ENB please uninstall this and don't use it. thank you aers, i never understood why the characters were so dark compared to oldrim... it bugged me for years.... and it was a bugthesda fail. . . . I've having a strange issue with this mod installed. When I quick-save, every once in a while the game world gets brighter when I'm inside a cave, or darker when I'm outside. I've experienced this issue as well recently and I did not have this mod installed. For me, it was a problem caused by the mod "Vivid Weathers". I am still not sure what caused this problem (too many mods need to be loaded? Corrupt save? Error in Vivid Weathers itself). Either way, what fixed it for me was I uninstalled the mod, reloaded the game, saved again with the mod installed, reinstalled the mod, and the problem was gone. If you use ELFX as well, I suggest uninstalling and reinstalling that in the same manor as well. Sry for the late response, had not seen this pot or mod this mod until today. I hope this solves your problem (If you haven't already fixed it). Is this compatible with ENBoost v0.283? I had issues, did not come from this mod! Sorry about that! Everything works perfectly! Thank you ! I use a ReShade. It's called Color Balance ReShade Preset. Can I use it? Of course, Reshade is only post-process! If I use only EnbBoost? Is this related at all to the artifacts in shadows cast on characters from the sun? (doesn't seem to be an issue with interior light sources). No, won't have any effect on shadow casting. Those shaders are all over the place. Ah, but you know what issue I'm talking about? I tried asking about it in a few places but didn't get much responses. I'm hoping this eventually gets resolved too. It's a huge pet peeve for me right now, because everything else looks so good (thought shadows in SSE are still pretty pixelated compared to Oldrim ENB), yet I have this weird shadow noise on characters, most notable on their shoulders and chest. That's vanilla SSAO for you Spongeman131. Disable the vanilla SSAO & use ENB's instead. Use a higher Texture Resolution in ENB SSAO and enable filtering and denoising. @ff7legend: It's not the vanilla SSAO. That causes a grid-like pattern. Even when vanilla SSAO is off, there is still some other shadow artifact. It appears specifically when the character is outdoors and facing the sun. Unlike the grid-like SSAO shadow artifact, this issue is hard to see in screenshots and looks more like a temporal artifact. Maybe people with TXAA on won't see it since TXAA has a temporal blur effect. Yeah, it's like the game keeps re-evaluating the shadows and can't decide what it's supposed to be showing. If you use tfc 1 and fly around, you can see these shadows/artifacts "buzz" where as other shadows stand still and remain constant. maybe theres a precision issue in the shadow shader. theres some obnoxious character shadows indoors too. Any chance you'd be able to fix that? It really makes SSE look bad in comparison to Oldrim. This exists in Skyrim LE as well. Change fShadowDirectionalBiasScale to somewhere between 0.30 and 0.60 to remedy shadow striping. fShadowBiasScale should be 1 (this is different from Oldrim). Be sure that iShadowMapResolutionPrimary is set to a multiple of 4 (1024, 2048, 4096, or 8196, wouldn't recommend going higher. Some people like setting this to 3000 or 4000 but your mileage may vary). fShadowDistance will stretch the shadow map out (the higher this is, the further out high-res shadows will be rendered, but introduces artifacts unless fShadowDistance is increased). iShadowMaskQuarter should be 4. I personally recommend using BethINI to tweak your INI settings. I was hoping that would fix it, but it didn't. I didn't have fShadowDirectionalBiasScale or fShadowBiasScale in Skyrim.ini so they would be using the default values. The default for fShadowBiasScale is the correct value. The default value for fShadowDirectionalBiasScale is 0.3, which is within the range you suggested. I also tried 0.45 and 0.60. Neither fixed it. Maybe because what you suggested is a shadow stripping fix, and the artifacts I'm seeing are not in a stripe pattern. I don't have this problem in Skyrim LE. If you're using ENB's SSAO (you shouldn't use ENB with this bugfix) it can cause some shadow striping too if it's set to low quality. In enbseries.ini under [SSAO_SSIL] change SamplingQuality= to -1 for highest quality. I don't recall if SkyrimSE's own SSAO does this too but there definitely wouldn't be an easy fix for it. I'm not sure this artifact would be considered shadow striping. And the problem is visible even when ENB is off. 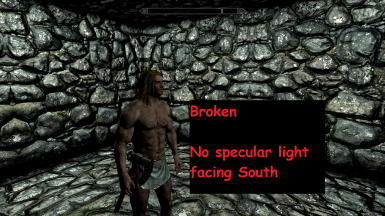 I have Skyrim SSAO disabled because that causes some other artifact. It's a grid-like artifact and is what people normally think of first when mentioning shadow artifacts on actors. I looked at the shadow map shader.. its an artifact of the algorithm they're using for the edges of shadows combined with the constant movement of idle animations, this is why it mostly looks okay when you take a screenshot. Awesome, so confirmed it's a shader issue. Any chance you'll be able to fix that? One of the downsides of switching from LE to SSE is that LE with ENB looks better due to the SSE visual bugs. If those can be fixed (along with the eye shader issue), then even screenshotters would probably have no reason to stick with LE anymore. Also I dunno if the shadows can be fixed mostly because I don't have experience writing shaders :\ If I knew anything about shadow algorithms maybe. I wonder what LE uses. On the eyes, when it's dark or the character is standing in the shadows (e.g. under a bridge or something), your character's eyes will look unnaturally bright (almost like it's glowing). Not sure if that's an issue with the specular shader or something else, but it's weird looking. 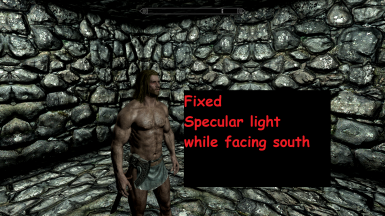 Is it possible to extract more shader fixes from ENB like this mod? because ENB has absolutely atrocious performance in Skyrim VR so a way to use some of its improvements as a separate mods would be very useful. It really depends on the kind of fixes. Does this actually work on VR, btw? I dont know if the VR version has any different shaders because I don't own it to check. VR is very close to SSE in many aspects. The major difference is in the UI and character control. Mods like textures, models and realistic lighting overhaul work the same way. I installed this mod and I think character lighting is better, at least from a point light sources like lamps. If you installed the mod and the game still displays stuff properly it probably has the same shader set, tbh. Yeah, I think so too. And so I am interested in applying other "shader fixes" without using ENB. SSE is just a joke. When they moved from DX9 to DX11 rendering they had to rewrite all the shaders, which is how this bug happened.